Complete your look with the Guinness Estd. 1759 Baseball Cap. Made from a durable, breathable cotton, this classic six panel baseball cap features a curved visor and ventilating eyelets, perfect for those warm summer days! 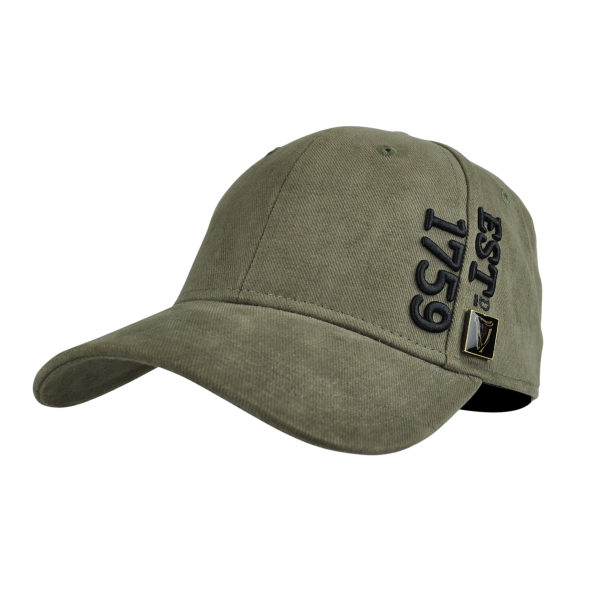 In a muted military green colour, this cap features 'ESTD 1759' embroidered on the side, a tribute to the year Guinness was founded. Also featuring the Guinness Harp. This baseball cap is adjustable to fit for all sizes. Guinness® Official Merchandise: This product celebrates an extraordinary brand, which for over two centuries has been held in great affection around the world. For many, Guinness® has come to symbolize a way of life, always with style, wit, and good humor. This product is intended for purchase and enjoyment by people of legal purchase age for alcoholic beverages.